Cholangiocarcinomas (CCCs) are malignancies of the biliary duct system that may originate in the liver and extrahepatic bile ducts, which terminate at the ampulla of Vater. [1, 2, 3, 4, 5] CCCs are encountered in three anatomic regions: intrahepatic, extrahepatic (ie, perihilar), and distal extrahepatic. See the image below. Bismuth classification for perihilar cholangiocarcinoma. Shaded areas represent tumor location. Perihilar tumors are the most common CCCs, and intrahepatic tumors are the least common. Perihilar tumors, also called Klatskin tumors (after Klatskin's description of them in 1965  ), occur at the bifurcation of right and left hepatic ducts. Distal extrahepatic tumors are located from the upper border of the pancreas to the ampulla. More than 95% of these tumors are ductal adenocarcinomas; many patients present with unresectable or metastatic disease. Cholangiocarcinomas arise from the intrahepatic or extrahepatic biliary epithelium. More than 90% are adenocarcinomas, and the remainder are squamous cell tumors. The etiology of most bile duct cancers remains undetermined. Long-standing inflammation, as with primary sclerosing cholangitis (PSC) or chronic parasitic infection, has been suggested to play a role by inducing hyperplasia, cellular proliferation, and, ultimately, malignant transformation. Intrahepatic cholangiocarcinoma may be associated with chronic ulcerative colitis and chronic cholecystitis. Cholangiocarcinomas tend to grow slowly and to infiltrate the walls of the ducts, dissecting along tissue planes. Local extension occurs into the liver, porta hepatis, and regional lymph nodes of the celiac and pancreaticoduodenal chains. Life-threatening infection (cholangitis) may occur that requires immediate antibiotic intervention and aggressive biliary drainage. Each year, approximately 2500 cases of cholangiocarcinoma occur, compared with 5000 cases of gallbladder cancer and 15,000 cases of hepatocellular cancer. The average incidence is one case per 100,000 population per year. Incidence in most Western countries ranges from 2 to 6 cases per 100,000 people per year. The highest annual incidences are in Japan, at 5.5 cases per 100,000 people, and in Israel, at 7.3 cases per 100,000 people. Despite aggressive anticancer therapy and interventional supportive care (ie, wall stents or percutaneous biliary drainage), the median survival rate is low, since most patients (90%) are not eligible for curative resection. The overall survival is approximately 6 months. Native Americans have the highest annual incidence in North America, at 6.5 cases per 100,000 people. This rate is about 6 times higher than that in non–Native American populations. The high prevalence of cholangiocarcinoma in people of Asian descent is attributable to endemic chronic parasitic infestation. Blechacz B. Cholangiocarcinoma: Current Knowledge and New Developments. Gut Liver. 2017 Jan 15. 11 (1):13-26. [Medline]. [Full Text]. Razumilava N, Gores GJ. Cholangiocarcinoma. Lancet. 2014 Jun 21. 383 (9935):2168-79. [Medline]. [Full Text]. Blechacz B, Gores GJ. Tumors of the Bile Ducts, Gallbladder, and Ampulla. In: Fledman M, Friedman LS, Brandt LJ, eds. Sleisenger and Fordtran's Gastrointestinal and Liver Disease. 10th ed. Philadelphia, PA: Elsevier Saunders; 2015. 1171-83. Patel T, Borad MJ. 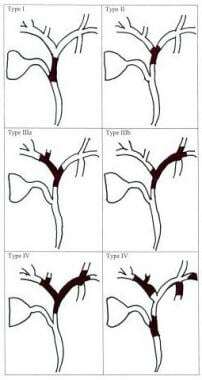 Cancer of the Biliary Tree. DeVita VT Jr, Lawrence TS, Rosenberg SA, eds. DeVita, Hellman, and Rosenberg's Cancer: Principles and Practice of Oncology. 10th. Philadelphia, Pa: Wolters Kluwer Health; 2015. 715-33. Banales JM, Cardinale V, Carpino G, Marzioni M, Andersen JB, et al. Expert consensus document: Cholangiocarcinoma: current knowledge and future perspectives consensus statement from the European Network for the Study of Cholangiocarcinoma (ENS-CCA). Nat Rev Gastroenterol Hepatol. 2016 May. 13 (5):261-80. [Medline]. Klatskin G. Adenocarcinoma of the hepatic duct at its bifurcation within the porta hepatis. An unusual tumor with distinctive clinical and pathological features. Am J Med. 1965 Feb. 38:241-56. [Medline]. Clary B, Jarnigan W, Pitt H, et al. Hilar cholangiocarcinoma. J Gastrointest Surg. 2004 Mar-Apr. 8(3):298-302. [Medline]. Doherty B, Nambudiri VE, Palmer WC. Update on the Diagnosis and Treatment of Cholangiocarcinoma. Curr Gastroenterol Rep. 2017 Jan. 19 (1):2. [Medline]. Singal AK, Vauthey JN, Grady JJ, Stroehlein JR. Intra-hepatic cholangiocarcinoma--frequency and demographic patterns: thirty-year data from the M.D. Anderson Cancer Center. J Cancer Res Clin Oncol. 2011 Jul. 137(7):1071-8. [Medline]. Mimaki S, Totsuka Y, Suzuki Y, Nakai C, Goto M, Kojima M, et al. Hypermutation and unique mutational signatures of occupational cholangiocarcinoma in printing workers exposed to haloalkanes. Carcinogenesis. 2016 Aug. 37 (8):817-26. [Medline]. Kim TS, Pak JH, Kim JB, Bahk YY. Clonorchis sinensis, an Oriental Liver Fluke, as a Human Biological Agent (Carcinogen) of Cholangiocarcinoma: A Brief Review. BMB Rep. 2016 Jul 7. [Medline]. Cancer Facts & Figures 2018. American Cancer Society. Available at https://www.cancer.org/content/dam/cancer-org/research/cancer-facts-and-statistics/annual-cancer-facts-and-figures/2018/cancer-facts-and-figures-2018.pdf. Accessed: August 29, 2018. McGee EE, Castro FA, Engels EA, Freedman ND, Pfeiffer RM, Nogueira L, et al. Associations between autoimmune conditions and hepatobiliary cancer risk among elderly US adults. Int J Cancer. 2018 Aug 28. [Medline]. Koshiol J, Ferreccio C, Devesa SS, Roa JC, Fraumeni JF Jr. Biliary Tract Cancer. Thun MJ, Linet MS, Cerhan JR, Haiman CA, Schottenfeld D, eds. Cancer. Epidemiology and Prevention. 4th Edition. New York, NY: Oxford University Press; 2018. 661-671. Chalasani N, Baluyut A, Ismail A, et al. Cholangiocarcinoma in patients with primary sclerosing cholangitis: a multicenter case-control study. Hepatology. 2000 Jan. 31(1):7-11. [Medline]. Travis LB, Hauptmann M, Gaul LK, Storm HH, Goldman MB, Nyberg U, et al. Site-specific cancer incidence and mortality after cerebral angiography with radioactive thorotrast. Radiat Res. 2003 Dec. 160(6):691-706. [Medline]. Li JS, Han TJ, Jing N, Li L, Zhang XH, Ma FZ, et al. Obesity and the risk of cholangiocarcinoma: a meta-analysis. Tumour Biol. 2014 Apr 13. [Medline]. Ramage JK, Donaghy A, Farrant JM, Iorns R, Williams R. Serum tumor markers for the diagnosis of cholangiocarcinoma in primary sclerosing cholangitis. Gastroenterology. 1995 Mar. 108 (3):865-9. [Medline]. [Full Text]. Bergquist JR, Ivanics T, Storlie CB, Groeschl RT, Tee MC, Habermann EB, et al. Implications of CA19-9 elevation for survival, staging, and treatment sequencing in intrahepatic cholangiocarcinoma: A national cohort analysis. J Surg Oncol. 2016 Jul 20. [Medline]. Keiding S, Hansen SB, Rasmussen HH, et al. Detection of cholangiocarcinoma in primary sclerosing cholangitis by positron emission tomography. Hepatology. 1998 Sep. 28(3):700-6. [Medline]. Fritscher-Ravens A, Broering DC, Knoefel WT, et al. EUS-guided fine-needle aspiration of suspected hilar cholangiocarcinoma in potentially operable patients with negative brush cytology. Am J Gastroenterol. 2004 Jan. 99(1):45-51. [Medline]. American Joint Committee on Cancer. Amin MB, Edge S, Greene F, Byrd DR, Brookland RK, et al, eds. AJCC Cancer Staging Manual. 8th Edition. New York: Springer; 2017. Butros SR, Shenoy-Bhangle A, Mueller PR, Arellano RS. Radiofrequency ablation of intrahepatic cholangiocarcinoma: feasability, local tumor control, and long-term outcome. Clin Imaging. 2014 Feb 7. [Medline]. Kida M, Miyazawa S, Iwai T, et al. Endoscopic management of malignant biliary obstruction by means of covered metallic stents: primary stent placement vs. re-intervention. Endoscopy. 2011 Dec. 43(12):1039-44. [Medline]. Ortner MA, Liebetruth J, Schreiber S, et al. Photodynamic therapy of nonresectable cholangiocarcinoma. Gastroenterology. 1998 Mar. 114(3):536-42. [Medline]. Ortner ME, Caca K, Berr F, et al. Successful photodynamic therapy for nonresectable cholangiocarcinoma: a randomized prospective study. Gastroenterology. 2003 Nov. 125(5):1355-63. [Medline]. Jackson MW, Amini A, Jones BL, Rusthoven CG, Schefter TE, Goodman KA. Treatment Selection and Survival Outcomes With and Without Radiation for Unresectable, Localized Intrahepatic Cholangiocarcinoma. Cancer J. 2016 Jul-Aug. 22 (4):237-42. [Medline]. Mosconi C, Gramenzi A, Ascanio S, Cappelli A, Renzulli M, Pettinato C, et al. Yttrium-90 radioembolization for unresectable/recurrent intrahepatic cholangiocarcinoma: a survival, efficacy and safety study. Br J Cancer. 2016 Jul 26. 115 (3):297-302. [Medline]. Thongprasert S, Napapan S, Charoentum C, Moonprakan S. Phase II study of gemcitabine and cisplatin as first-line chemotherapy in inoperable biliary tract carcinoma. Ann Oncol. 2005 Feb. 16(2):279-81. [Medline]. Thongprasert S. The role of chemotherapy in cholangiocarcinoma. Ann Oncol. 2005. 16 Suppl 2:ii93-6. [Medline]. [Guideline] NCCN Clinical Practice Guidelines in Oncology. Hepatobiliary Cancers. National Comprehensive Cancer Network. Available at https://www.nccn.org/professionals/physician_gls/pdf/hepatobiliary.pdf. Version 3.2018 — August 29, 2018; Accessed: August 29, 2018. Heimbach JK, Haddock MG, Alberts SR, et al. Transplantation for hilar cholangiocarcinoma. Liver Transpl. 2004 Oct. 10(10 Suppl 2):S65-8. [Medline]. Shen WF, Zhong W, Liu Q, Sui CJ, Huang YQ, Yang JM. Adjuvant Transcatheter Arterial Chemoembolization for Intrahepatic Cholangiocarcinoma after Curative Surgery: Retrospective Control Study. World J Surg. 2011 Jun 23. [Medline]. Seshadri RA, Majhi U. Endobiliary metastasis from rectal cancer mimicking intrahepatic cholangiocarcinoma: a case report and review of literature. J Gastrointest Cancer. 2009. 40 (3-4):123-7. [Medline]. Anderson MA, Appalaneni V, Ben-Menachem T, Decker GA, Early DS, Evans JA, et al. The role of endoscopy in the evaluation and treatment of patients with biliary neoplasia. Gastrointest Endosc. 2013 Feb. 77 (2):167-74. [Medline]. [Guideline] Valle JW, Borbath I, Khan SA, Huguet F, Gruenberger T, Arnold D, et al. Biliary cancer: ESMO Clinical Practice Guidelines for diagnosis, treatment and follow-up. Ann Oncol. 2016 Sep. 27 (suppl 5):v28-v37. [Medline]. [Full Text]. Polistina FA, Guglielmi R, Baiocchi C, et al. Chemoradiation treatment with gemcitabine plus stereotactic body radiotherapy for unresectable, non-metastatic, locally advanced hilar cholangiocarcinoma. Results of a five year experience. Radiother Oncol. 2011 May. 99(2):120-3. [Medline]. Atanasov G, Schierle K, Hau HM, Dietel C, Krenzien F, Brandl A, et al. Prognostic Significance of Tumor Necrosis in Hilar Cholangiocarcinoma. Ann Surg Oncol. 2016 Aug 1. [Medline]. Ghafoori AP, Nelson JW, Willett CG, et al. Radiotherapy in the treatment of patients with unresectable extrahepatic cholangiocarcinoma. Int J Radiat Oncol Biol Phys. 2011 Nov 1. 81(3):654-9. [Medline]. McMillan DC. The systemic inflammation-based Glasgow Prognostic Score: a decade of experience in patients with cancer. Cancer Treat Rev. 2013 Aug. 39 (5):534-40. [Medline]. Templeton AJ, McNamara MG, Šeruga B, Vera-Badillo FE, Aneja P, Ocaña A, et al. Prognostic role of neutrophil-to-lymphocyte ratio in solid tumors: a systematic review and meta-analysis. J Natl Cancer Inst. 2014 Jun. 106 (6):dju124. [Medline]. [Full Text]. Okuno M, Ebata T, Yokoyama Y, Igami T, Sugawara G, Mizuno T, et al. Appraisal of inflammation-based prognostic scores in patients with unresectable perihilar cholangiocarcinoma. J Hepatobiliary Pancreat Sci. 2016 Jul 30. [Medline]. Gunderson LL, Willett CG. Pancreas and hepatobiliary tract. Perez CA, Brady LW, et al. Principles and Practice of Radiation Oncology. 3rd ed. Philadelphia, Pa: Lippincott-Raven; 1998: 1467-1488. Lillemoe K, Kennedy A, Picus J. Clinical management of carcinoma of the biliary tree. Kelsen DP, Daly JM, Kern SE, et al. Gastrointestinal Oncology: Principles and Practices. Philadelphia, Pa: Lippincott Williams & Wilkins; 2001. Uchida M, Ishibashi M, Tomita N, et al. Hilar and suprapancreatic cholangiocarcinoma: value of 3D angiography and multiphase fusion images using MDCT. AJR Am J Roentgenol. 2005 May. 184(5):1572-7. [Medline]. Tight stricture of a common hepatic duct in a patient presenting with jaundice. Cytologic studies confirmed cholangiocarcinoma. Three-dimensional treatment planning uses CT scan slices to reconstruct the patient as a volume. Shown here is the display for planning external-beam radiotherapy to the cholangiocarcinoma (green structure). A biliary catheter (red tube) runs through the tumor volume and was used to deliver brachytherapy, which was given in addition to external-beam radiotherapy. Such technology has assisted greatly in the delivery of high doses to the tumor, while sparing vital normal structures, such as the kidney and spinal cord. Table 2. TNM staging for perihilar bile duct tumors. Table 3. TNM staging for distal bile duct tumors.